The Unmutual Website is indebted to Paul Weston and Ian Price for contacting the site recently with images and details of some superb model-making which they have been undertaking. Both are fans of "The Prisoner" and Portmeirion and between them have created models of the Electropass scene from "Arrival" (left), Number Six's House (below) and a Lotus 7! Click HERE to see the models in full and with more details. Paul told TUW; "Labours of love is how I would refer to mine and Ian's work! 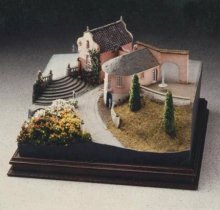 As they take such a long time to craft our existing models aren't themselves for sale but thats not to say we couldn't be commissioned to create new versions, or in the case of my Portmeirion models new buildings and can contact us via your website for rates." 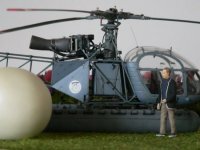 UPDATE 16/12/12 - Ian Price's models are now for sale! Contact TUW with an offer! With thanks to Paul Weston and Ian Price for this news item.